Ron and Shelly Hamilton share a burden to encourage young composers to use their talents for the Lord. 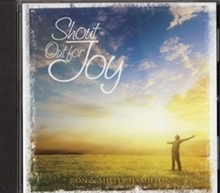 Their newest choral collection Shout Out for Joy includes songs written or arranged by several young musicians whose desire is to honor Christ with their abilities: Brian Buda, Ben Everson, Klayton Hoefler, Paul Keew, Shelton Love, Jonathan Reid, and Reba Snyder. Two melodies, I Am Weak, but You Are Strong and The Way of the Cross, were composed by Jonathan Hamilton, who passed away in May of this year. The ten selections offer praise and exaltation to God Who is our strength and song.